What do you call these cookies? I have heard them called Russian teacakes, Mexican wedding cakes, and snowball cookies. To us, these are Russia teacakes. Whatever the name, they are melt-in-your-mouth delicious. They are also easy to make and don’t require any special ingredients. As much as I love trying new recipes, I truly enjoy making (and eating) the classics most of all. Just like an old song on the radio can bring on a rush of memories, so too can the taste of a favorite Christmas cookie. This cookie reminds me of a White Christmas, and that is why I am choosing to enter it in Very Good Recipes White Christmas Challenge! You can enter too—you have until December 26th to submit your recipe. You can find all the details as well as view all the recipes entered at the link below. 1. Preheat oven to 400°F.2. Mix butter, 1/2 cup powdered sugar, and vanilla in a large bowl.3. Stir in flour, nuts, and salt.4. Shape dough into 1-inch balls and place about 2 inches apart onto ungreased cookie sheet.5. Bake for 8 to 9 minutes, or until cookies are set but not brown.6. Remove from cookie sheet and immediately roll in powdered sugar.7. Allow cookies to cool completely then roll in powdered sugar a second time. I've always called them Mexican wedding cookies...I love them...The perfect Christmas cookies. Jill, this sounds like these same cookie I made today except yours are much better looking! Mine didn't stay round, they flattened a little. They had a great taste though! I'm impressed with how pretty yours are! I need to try this mexican wedding cookies. Love it. I make something similar, but they are crescent shaped. 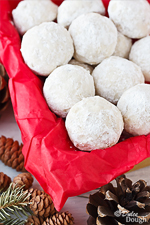 I thought these were snowballs, but either way, I love eating lots of them at Christmas time. Hope you and your family have a Merry Christmas. These by far are one of my favorites as well as a holiday tradition. The recent cookie swap revealed that others favored them too. Also there has been a myriad of variations introduced. Your cookies do look picture perfect and I am sure pleased everyone who had a chance to taste them. Merry Christmas my friend! Ahhh, I make these every year. because if I don't, my daughter will murder me lol. Originally I called them Russian teacakes, but over the years they have just become snowball cookies here too. The recipe I use was called Crescents...but I now make them in spheres and call them Pecan Snowballs. Whatever they're called, I LOVE them! Yours are perfect, Jill! I call them GOOD cookies! I haven't had one of these for years! My Gramma P used to make them for the holidays when I was younger :) These look amazing! I always called them Russian Tea Cakes as well and they are so delicious and melt in your mouth not in your hands! Yours are picture perfect. You're an incredible cookie maker. You could sell yours they're so beautiful. Pparecen perlas deben deshacerse en la boca una exquisitéz,abrazos y feliz navidad,hugs,hugs. These are gorgeous! I just have to make sure not to wear black when I eat them LOL!! Happy Holidays! I made something similar,they were called mexican wedding cookies.Wow ! they seem good. These are beautiful, Jill! I love that they don't have a ton of ingredients either. I am in need of an easy dessert for Christmas day! Merry Christmas, my friend! Jill, the photo of these cookies is absolutely amazing! We always called them Mexican wedding cakes, but Russian Tea Cookies sounds so elegant. They look completely delicious...a true winner! Happy Holidays! These are gorgeous! Merry Christmas, Jill! Amazing! I like that they are easy to make. I think these are just lovely and best of luck with the challenge! I call them snow ball meltaways, but I also have heard them called the others. Whatever you call them - they're delicious! I love snowballs! They are really great, esp. during the holiday season. I am alien to these teacakes and what every is the name I am fine with it but they sure look very delicious and tempting. Yum~ I've never had these before :) but like you I love classic recipes the most! Your teacakes are so pretty! I'm with you. I try lots of new recipes for my blog, but many of my favorites are still the classics. There are some cookies that have that perfect texture to melt in your mouth. Call them what you will these are delectable and perfect for the Christmas table. Does anyone know if these cookies freeze well? Can they be frozen and then rolled in powdered sugar when served? They do freeze well. I have frozen them already rolled in powdered sugar. Yes, our Greek cousins make them for holidays. They are wonderful. I am a fan of a lot of color, so I sat one day trying to figure out how to make these more colorful. I took the colored sugars and put them in the blender. They will basically turn into a colored powder sugar, and you can then roll them right in that. Turned out very colorful!!! Keep them white, but use bright serving dish-- like red. I wanted to make them be colored, so I added some food coloring to the dough, and then I took the colored decorating sugars into the blender. They will become colorful powdered sugar, and just roll them cookies in that. Very cute when you add a little color. I only got like a dozen plus 8 more??? It says 4 dozen. I don't see how you could get 4 dozen. Did you double the recipe? This is a very good recipe. I cut all ingredients in half and the cookies came out as they should have!